New business models become reality, due to the saturation of the economy with computers and networks. Uber, AirBnB, Alibaba, Youtube and many more have created platforms, where service providers can meet and agree with interested people. These services poach, up to now, in the traditional business fields of taxi companies, hotels, department stores and media corporations. Typically, these platforms do not feel in competition with traditional providers. No drivers are hired, no hotels are operated, no goods are moved and no content is generated. In fact, they are not subject of existing regulations, which, for example, taxi drivers have to meet: a clearance certificate free of traffic offenses and other criminal acts, a medical certificate, the technical standards of the vehicles, the provisions of the passenger transportation law. In this sense, today’s platform providers are not commercial service providers in the above sense, but they are simply offering a place, where the providers and users can get together. What constitutes such a platform? In the first step, we look at various building blocks, which form together the platform. A platform connects three groups of people. 1) The producers, who offer certain products respectively services. 2) Consumers, who are looking for these products and services. 3) The brokers, who connect producers and consumers and operate for this purpose a platform. The unique selling proposition of a platform, the USP, is the added value that the providers and buyers of the services as well as the intermediaries draw from the platform. A common interest may be the business sector (e.g. passenger transportation, accommodation, consulting and coaching services for companies). The producers have direct access to individual consumers. They find similar services bundled under one umbrella. The mediators benefit from the network that evolves over time. Services become visible, comparable and accessible on one platform. For this purpose stands are built, just as in a marketplace, in which the providers present their deliverables. The platform operators have the task to prepare the marketplace in such a way that allows the providers to present themselves in an easy way and that provides the buyers at one place the desired deliverables. This includes measures that ensure the reliability of the providers, make the offers comparable, enable the exchange of information and even ensure trustworthy payment transactions. A platform lives on the available content. These are e-books, brochures, white papers that are ultimately provided by all protagonists. In addition, information brokers can place here payable content. The appeal of the platform increases eventually through appropriate interaction functions: forums, surveys and the like. Bottom line: The platform is the basis for many new business models and at the same time the hub for a wide variety of business areas. 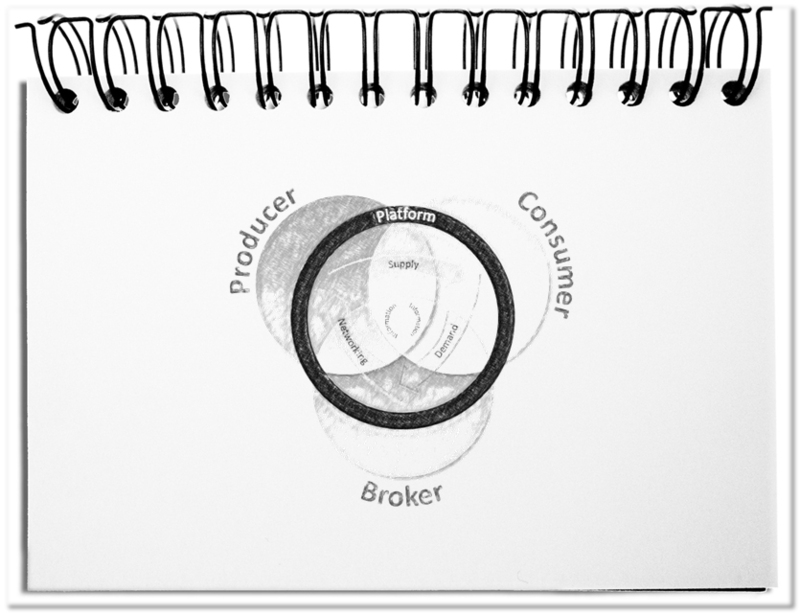 Producers, consumers and brokers exchange their contributions under one umbrella. Like traditional market places, every participant can meet its needs here: offering and buying services and exchanging information. The variety of possible uses and the satisfaction of the interests of all protagonists constitute the platform. Dieser Beitrag wurde am Dezember 9, 2017 von memecon in English, Management veröffentlicht. Schlagworte: Added value, Information hub, Marketplace, Point of Sales, Protagonists, Roles.